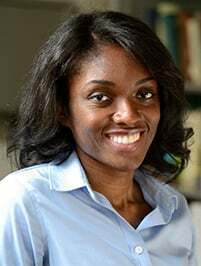 Congratulations to Muyinatu “Bisi” Bell, an assistant professor in the Department of Electrical and Computer Engineering with appointments in the departments of Biomedical Engineering and Computer Science, who has been selected to receive NIH’s Trailblazer Award. Prof. Bell and her team will use the award to conduct pioneering research that integrates deep learning with ultrasound image formation to provide interventional radiologists with a new (and clearer) type of ultrasound image. These novel images only display structures of interest, such as a needle tip as it is inserted into the kidney and the corresponding kidney target location, addressing often problematic ultrasound image-quality issues. The proposed approach is the first of its kind to use data-driven methods to replace the traditional ultrasound image formation process. She is director of the Photoacoustic and Ultrasonic Systems Engineering (PULSE) Lab and, in addition to being a HEMI Fellow, also is a member of the Malone Center for Engineering in Healthcare.